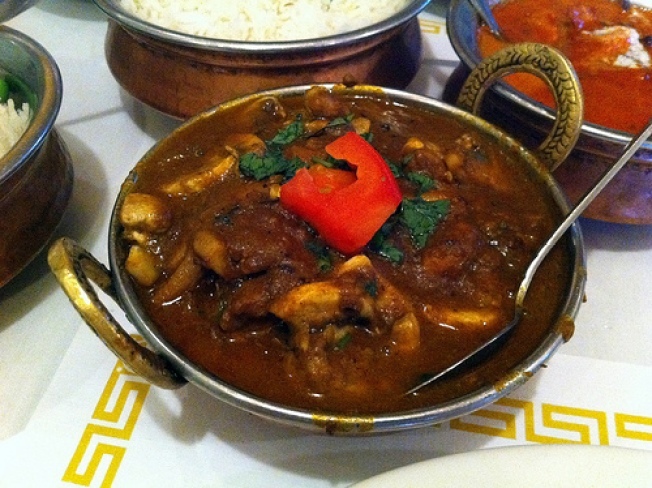 Bay Area foodie reviews A Taste of the Himalayas. I had no idea what to expect when I met my friend Natasha at A Taste of the Himalayas for a Nepalese dinner in Berkeley’s Gourmet Ghetto. All I knew of Nepalese cuisine is that it’s somewhat similar to Indian: lots of lentils, chutneys, pickles, and aromatic spices. But Nepalese cuisine is diverse, with not only South Asian influences, but Tibetan and Chinese as well. We started with the split pea soup. Cumin-flecked and hearty, this creamy soup was comfort food as its best. It reminded me of Indian dal, or Iranian adasi. While we waited for our entrees to arrive, we also ordered three baskets of naan. I mean, you can never have enough naan. Buttery, flaky, delicious naan. But I digress. A Taste of the Himalayas offers lots of Indian cuisine standards on the menu (think chicken tikka masala, butter chicken, and a range of tandooris and biryanis), but I was curious to try the Nepalese specialties. I Kukhura Chiyau Tarkari, or chicken cooked with mushrooms. Hearty and aromatic, I could only get through half of this before calling it an evening. Service is friendly at A Taste of the Himalayas and I only recently learned that they’re participants in the Karma Kitchen. How very Berkeley. For those in the East Bay, A Taste of the Himalayas is a unique option if you’re curious about trying out an oft-overlooked but tasty cuisine. Mariam Hosseini is a Bay Area native who has been writing about food and travel since 2003. She blogs regularly at yogurtsoda.com.